Posted on Tue, Jan 17, 2012 : 5:03 a.m.
Charlyn Swarthout, Matthew David and Guy Sanville in the Purple Rose production of "A Stone Carver." According to actress/director Rhiannon Ragland, Purple Rose Theatre artistic director Guy Sanville saw and read William Mastrosimone’s “A Stone Carver”—starting performances Thursday at the Rose—when it had its New York premiere in 2006, and he’s had it in his “back pocket file” ever since. So the time for the show has now arrived, with Sanville—who most often directs shows at the Rose—taking on the role of Agostino, an aging, seventh-generation stone mason who balks at being evicted from the home he built himself in order to make way for a highway. 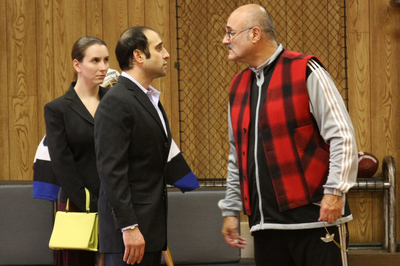 When Agostino barricades himself in the house, his son, Raff (Matthew David) arrives to try to persuade his father to comply with authorities. Who: Purple Rose Theatre Company. What: William Mastrosimone’s play about a retired, seventh generation stonemason who barricades himself in his home when he’s evicted to make space for a highway, and his son, Raff, who arrives at the house with his new fiancÃ©e in a last-ditch effort to save his father from jail. Where: Purple Rose Theatre, 137 Park St. in Chelsea. How much: $25-$40. (Preview performances cost $5-$10 less per ticket, and discounts are available for seniors, students, teachers, and groups.) 734-433-7673 or www.purplerosetheatre.org. As an actor, Ragland has appeared in numerous Rose productions under the direction of Sanville. So what was it like to have the tables turned? “Well, because we’ve worked together so many times, we already had a kind of base language, and that really helped a lot,” said Ragland. “But then (Sanville) really did let go. In another seeming reversal, of course, Ragland is a female director overseeing a play tightly focused on father-son relationships. But Ragland felt a natural tie to the material. “The funny thing was, it was kind of right up my alley,” said Ragland. “I’m kind of a guy’s girl. The joke is that I strap my tool belt on over my dress. Â And a lot of times, I understand men more than I understand women." Most theatergoers recognize Mastrosimone’s name by way of his hit “Extremities,” but “Stone Carver” is clearly a more personal work for the playwright. He wrote the original draft of the play, then called “The Understanding,” in a playwriting class in the mid-70s, and re-visited the story after becoming a father himself. but it’s really a story about family,” said Ragland. “Old ideas versus new ideas. He writes conflict very well, and he doesn’t write jokes, but there are very funny moments. The humor comes out of the truth of the moment—out of identifying with somebody on that stage.